Well a few months after Canada day, I decided it was time to redo the room entirely. I had ordered a new bed which wouldn’t be arriving for a few months. 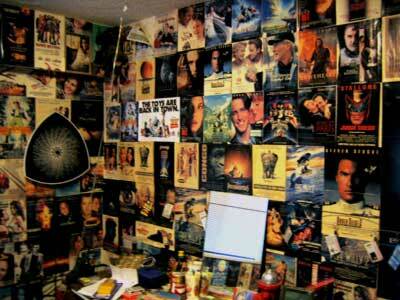 Like the closet, my wallpaper was ugly and done pretty poorly by the previous owners. As a result I had covered it up with a collection of movie posters. I wanted to paint the room, so it was time to take that all down. So this is what my room started out with. Literally plastered with clippings on top of dingy wallpaper on top of a poorly painted wall. So tearing down the wallpaper wasn’t exactly too easy. First I had to remove anything mounted to the wall, picture frames, nails, screws, etc. 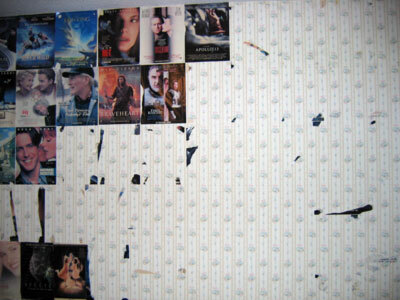 After which I proceeded to remove the movie posters (although messy I realized I could just leave them on whilst I removed the wallpaper). With the posters removed, I decided to have a little fun. How often do you get to draw on your walls? I doubt anyone has done so since their crayon incident involving a white wall and the parents. So I took the liberty to scrawl on the wall. 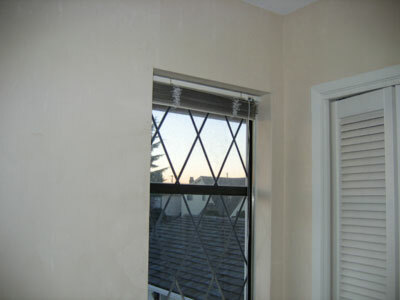 Since the previous owners did such a poor job of putting up the wallpaper in the first place, there were certain sections that just came right off with very minimal efforts. 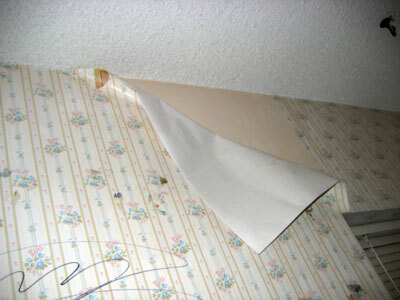 The paper was obviously not evenly dipped in the wallpaper adhesive when applied. For other sections of the wall that are more stubborn I used the steamer. Honestly, I should have just used it from the start everywhere since it was much faster. 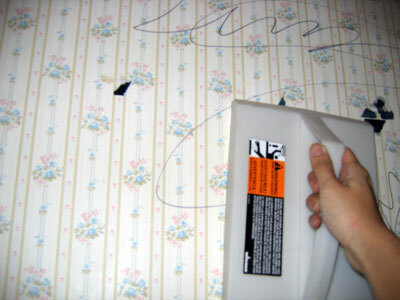 The steamer was great at loosening and removing the wallpaper. I had to score the wallpaper first, so I just went cut crazy with the knife all over the walls. You just have to be careful not to cut into the drywall underneath. This helps the steam penetrate. 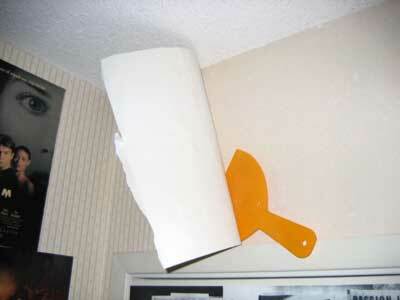 Once the paper is steamed enough (typically took about 10-20 seconds per section), it simply peels right off the wall. This part does get a little messy since it’s steamed paper, but certainly less messy than using the chemical removers. After everything is removed I ended up with a nice bare wall to work with.� The next part is patching up holes and sanding and removing gunk.